A week ago the access to the tourist cave Grotte de Niaux was blocked due to rockfall. About 30 m³ of blocks have been removed. The authorities from the region would like to announce that both the route and the cave are accessible again. 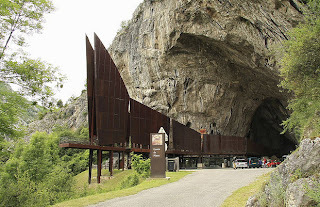 The Cave of Niaux is located in Niaux in the Ariège département of south-western France. Like Lascaux it contains many prehistoric paintings of superior quality, in the case of Niaux from the Magdalenian period. From the very beginning of the seventeenth century, the cave was of great interest for tourists who left numerous traces on its walls. People, visited the cave, did not imagine that the paintings of the "Salon Noire" were so old. Only in 1906 thanks to captain Molar and his sons who made a plan of the cave and discovered the paintings of the "Salon Noire". Niaux attracted the specialists' attention. In 1907 it was investigated by H. Breuill and E.Cartailhac. But discovery of the "Salon Noire" paintings was only the beginning. In 1925 J. Mandeman found a gallery with some black paintings and called it Cartailhac Gallery. Later it was established that the paintings had been emerging on the cave walls during a long period between 11500 and 10500 years BC. The main entrance to the Niaux cave used for visitors is now further up the hillside than it once was. In ancient times, there would have been several lower, smaller entrances. The visits to the cave are strictly regulated in order to maintain an even temperature of 12 degrees C and thus preserve the wall drawings of bison, horses and ibex. July through September there are 11 visits per day of up to 20 people with 45 minutes between each group, including a tour in English at 12:30pm. Three visits per day the rest of the year (no English tours). The caves are not lit up, visitors are handed torches, approximately 1 torch pr. 2 visitors, another measure to protect the paintings. Furthermore there is always the risk for one or two of the torches running out of battery during the visit, small children and anyone afraid of darkness should not go on this tour, once the tour has started there is no turning back. The walk to the paintings lead through both big caves and narrow passages. The cave floor has been left in its natural state: wet, very uneven and slippery in places so sturdy walking shoes are essential. It is recommended to book ahead. However, outside the ticket office a sign indicates how many spaces are left (if any) in the day's scheduled tours. If you arrive in the morning you might be able to reserve a spot in a tour in the afternoon. But don't count on this in July and August.